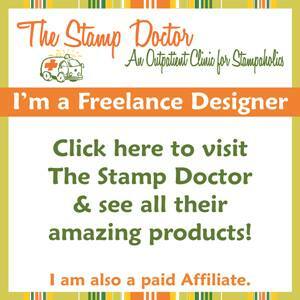 I’m very happy to be participating in the Kat Scrappiness blog hop to benefit Coffee Oasis. Coffee Oasis is an organisation in Washington State that helps youth, with a number of programs including for drug abuse, homelessness, violence and poverty. You can read more about the program here. The purpose of this hop is to bring awareness to Coffee Oasis, and hopefully to raise some money to support them. 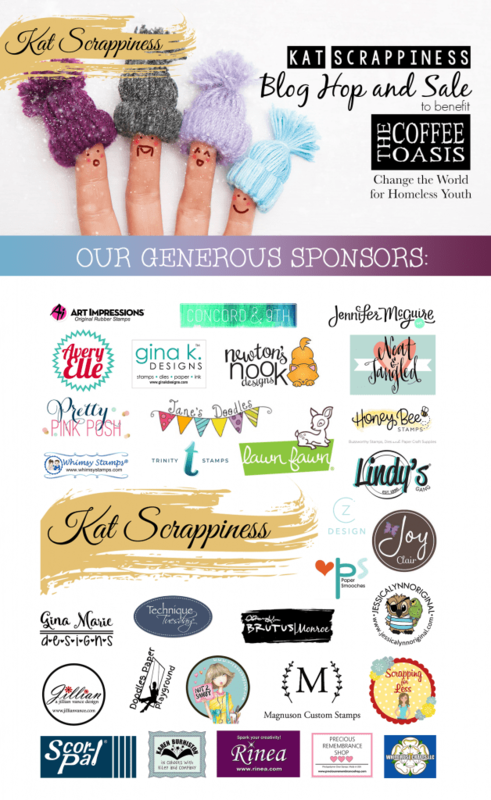 Kat Scrappiness will donate 15% of all sale proceeds to Coffee Oasis, and the many other sponsors are all donating prizes which I have listed at the bottom of this post, and make sure to check out the Kat Scrappiness blog for full details. If you’d like to donate to the cause directly you can do so at this link, or by clicking on the donation image below. The theme of the hop is Winter, so I decided to make a simple snowy card. At the moment I only have one thing from Kat Scrappiness, which is the Stitched Scalloped Border Dies. I definitely wanted to use them for my card, so I used that as my starting point. I began with a long snippet of white glitter card stock, the same width as my card base. I then took the curved scallop border and cut the snippet to create my back-most hill. I trimmed the snippet off to be the length I wanted, then used the smallest wavey scallop for my next hill. I repeated the process and cut a third time with the medium scallop wave, so that I had three hills in total. Next I started working on my sky. 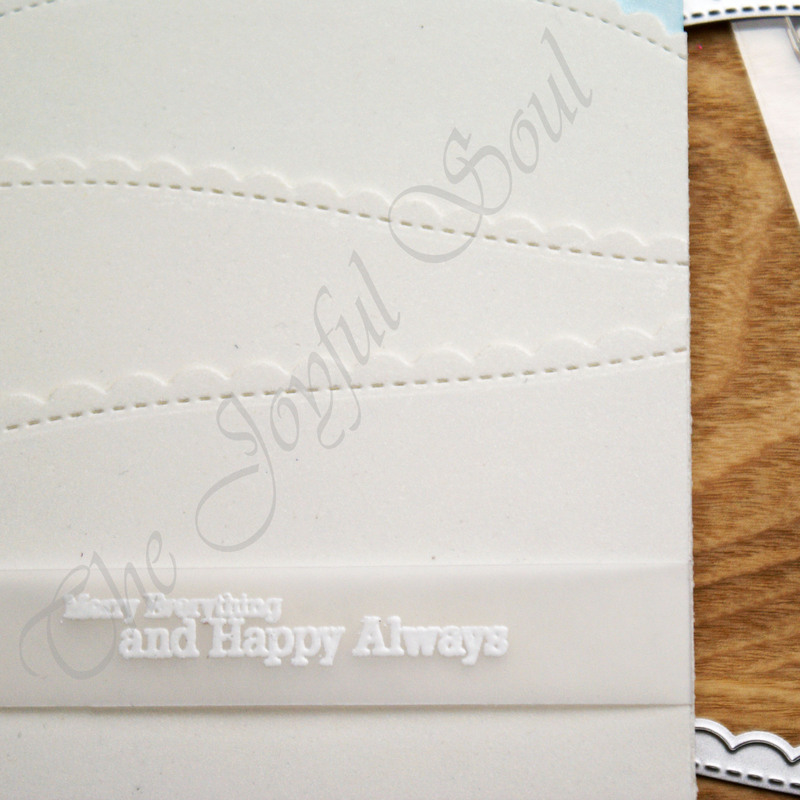 I wanted to keep the card mostly white so I didn’t want to add too much colour here. I marked my card so I knew where the sky needed to start, then used Tumbled Glass Distress Oxide to create a soft sky background. I then laid the Love From Lizi Falling Snow stencil over the blended area and spritzed with water mixed with Perfect Pearls in Perfect Pearl. I used a cloth to dab up the excess water. The snow in the sky was still a little more subtle than I would have liked, so I decided to add another layer. I flipped the stencil around so that the snow pattern wouldn’t be in the same place. I then pressed my embossing ink through the stencil. Removing the stencil I brushed Perfect Pearls directly onto the sky with a soft paintbrush. The Perfect Pearls clung to the sticky ink, giving the look of shimmery snowfall. I should probably have dried the sky prior to doing this as some of the shimmer clung to the sky elsewhere, but I don’t think it matters too much. The last element to create was my sentiment. I took a snippet of vellum and stamped and white heat embossed a sentiment from The Cat’s Pajamas’ Penguin Christmas onto it. I used my craft knife and a metal ruler to trim the vellum down, then attached it to my front most hill by wrapping it around and adhering it behind the panel. Finally I adhered everything together. I used double sided tape to adhere each hill layer to the next, then adhered the grouped hills to my card base. That completes my winter card for the hop. I hope you liked it! If you’d like to participate in the hop for the chance at one of the many prizes there are two ways to do that. You can either create a winter themed card and enter it into the hop, or leave a comment on the participating blogs and YouTube channels, as a super commenter will also win a prize. 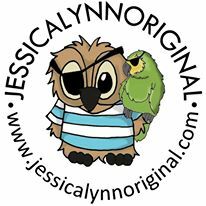 The randomly chosen winners will be picked on December 13th, posted to the Kat Scrappiness blog, and prizes must be claimed within 7 days. Click the blue button below to find the full hop list, and if you get lost along the way you can always head back to the Kat Scrappiness blog to start over. Such a pretty card. Love the sparkle. thanks for sharing your amazing inspiration, I just love you card – all that white is so elegant! This is brilliant! The stitched scalloped borders make fantastic snowdrifts! Thanks for playing along with CASology this week!